I have to speak to my soul. It is often still bouncing off the circumstances of yesterday. It feels more "pinball-ish" than purposeful. "Be still, and bless the Lord. Remember everything He has done for you!" He forgives all my sins. He heals each one of my diseases. His mercy makes me beautiful. and I am strong, overcoming. 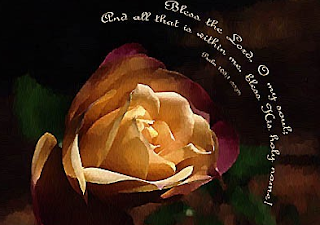 "Bless the Lord, O my soul. You will soar with purpose today. and walk in trust and confidence.